When you mix romantic travel with cultural adventure, you naturally arrive at Europe! And with the recent decline of the euro in value, 2016 is shaping up to be a great year for European getaways and honeymoons. 1. Santorini, Greece: one of the most breathtakingly beautiful places you will ever visit on earth! Imagine sipping drinks at a tiny restaurant perched on the edge of a volcanic cliff while the sun slowly sets over the Aegean sea. 2. 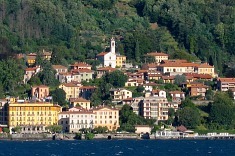 Bellagio, Italy: away from the chaotic hustle and bustle of Rome and the hordes of tourists in Venice, tiny Bellagio is known as the "Pearl of Lake Como". Dinner by the lakeside here is one of our most memorable evenings anywhere in Europe. 3. Bruges, Belgium: you'll be hard-pressed to find a more immaculate example of a medieval walled city in Western Europe. Cobblestone rules here, and the main square is a delight to be in day and night. 3 don't misses: beer, chocolates, and waffles that are out-of-this-world delicious! It’s been said that if you’re tired of London, you’re tired of life! 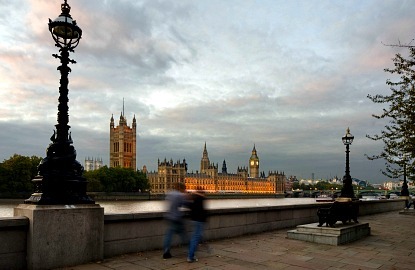 Here's just a few romantic London getaway ideas for your next journey to this mesmerizing city. The London Eye: The "Eye" has passenger capsules with 360 degree views of central London from a height of about 130 meters. They offer some excellent ideas for a romantic evening in London, like a Champagne Flight (35 GBP per person) and even more romantic (and expensive!) private cabins and the “Pimms and Strawberries” capsule with VIP entry, dinner and so on. The Cupid's Capsule option looks ideal for ideal for a London UK proposal location, with your own private ride up along with champagne and chocolates, priced at £ 325. Romantic Stroll along the Thames: Do the famous walk from Big Ben across Westminster Bridge (this is the place to pose together for your official "romantic London vacation" photo!) and over to the London Eye and Southbank. Drinks and the View at Vertigo42 Champagne Bar: astounding views from almost 600 ft up! One of the best times to go up is around 7:00 PM so you can experience the skyline of London in the late day and early evening hours. If your searching for ideas on romantic places to propose in London, keep this place in mind (it's a little cheaper than the London Eye as well). 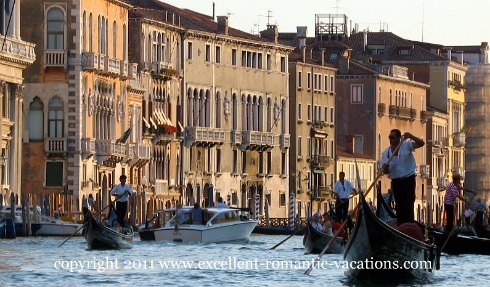 If your romantic break in Venice is on a tight budget and you just can't afford the Venice private gondola rides, there's 2 other options to consider: a Grand Canal boat ride in a vaporetto (only about €7), or hop on a gondola-like traghetto for a 90-second, 75¢ ride across the water to the other side (near the train station and at several other spots along the Grand Canal). 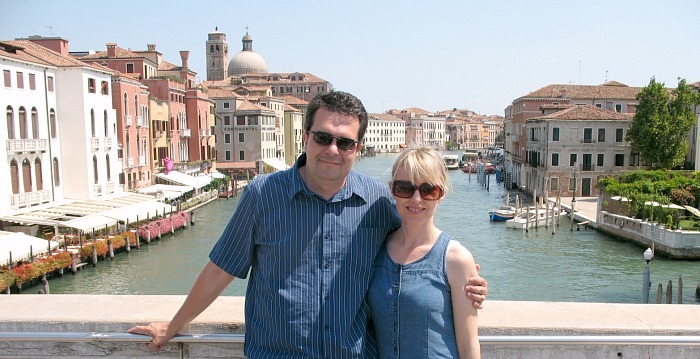 The Rialto Bridge and the Bridge of Sighs - two of the most romantic places in Venice. Bellinis for 2 at Harry’s - one of the most famous bars in Venice (dress code applies). Best Western Bologna Hotel - Mestre Station - located not far off the motorway to Venice, and a short 15 minute walk to shopping and restaurants in Mestre, Italy. 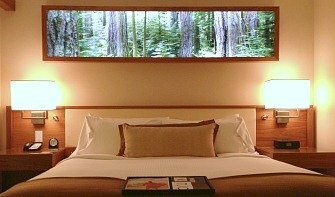 Reasons we loved this hotel: spotless, quiet rooms with a/c, WiFi and LCD TV, buffet breakfast each morning, and the super-convenient on-site car park. The train station is right across the street (10 minute train ride into Venice). 1. 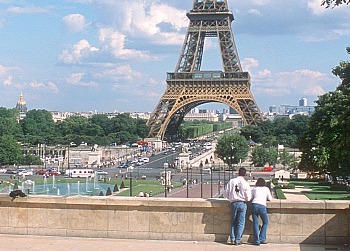 Grab some cheese, bread, fresh fruit and a small bottle of wine, and find a nice spot on the Champ de Mars lawn southeast of the tower for a romantic Paris picnic lunch. Seine River - If you only take one river cruise through a city in your life, make it this one. And to add to the romance, take it sometime in the early evening. You’ll pass landmarks, monuments, the Notre Dame Cathedral, Eiffel Tower, and centuries old bridges where people just linger and watch you sail by. Rue Cler - a small pedestrian-only street just a few blocks from the Eiffel Tower. It’s lined with butcher shops, fruit stands, cheese shops, bakeries, cafes and corner crepe stands. It's just the way you picture a Paris market street in your mind's eye, and a wonderful Parisian street for a romantic stroll. Romantic Rhine Valley Villages – Along the Rhine River, small towns and villages like St. Goar, Bacharac, Oberwesel and Boppard are terrific places to see. Bacharac's waterfront has a lovely park perfect for relaxing and watching the boats go by. 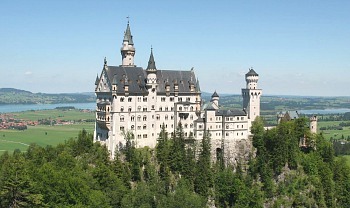 The Romantic Road - A wonderful route that winds it's way through central and southern Germany. It's certainly one of the best road trips in Europe for couples, especially exploring and overnighting in small villages and towns like Rothenburg and Fussen. Neuschwanstein Castle - Perched deep in a fairy tale Bavarian setting, Ludwig’s famous castle will add romance to your German vacation. Walking the trails through the woods and over the foot bridge above the gorge provides splendid views of the castle. Treff Hotel Luitpoldpark - a fine romantic hotel in Fussen, offering a choice of standard accommodation or a honeymoon suite. For a taste of luxury, try the romance package which includes a welcome cocktail, spa treatment and romantic dinner. Hotel Hornburg – a fine choice for romantic lodging in Rothenburg just outside the city walls. This rustic B&B offers very clean rooms, well-equipped bathrooms, a great breakfast (one of the best we had in Germany! )and very friendly innkeepers. Scotland certainly rates as one of the most romantic places in all of Europe. You don't have to have Scottish ancestry or roots here to feel a special connection with the land and the people. And if you love to self-drive at your own pace when on holidays, Scotland will reward you with scenery that you will remember for a lifetime. Edinburgh - The Castle is reason enough to visit, but don't miss the Royal Mile and Princes Street with plenty of restaurants, shops and places to load up on kilts and whisky! The Highlands - No romantic vacation in Scotland is complete without the Highlands. You can explore castles, take a Highlands Boat Cruises on Loch Shiel or Loch Ness, drive the scenic Road to the Isles (A830) from Ft. William to Mallaig, and stop in picturesque Villages like Plockton & Loch Carron. Isle of Skye - gives you a taste of the wild and remote "Islands of the Highlands". Dramatic scenery, expansive views of the Atlantic, and some seaside villages immersed in centuries-old Gaelic culture. 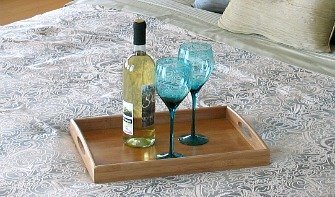 Ryeford B&B - This cozy bed and breakfast in Inverness Scotland is known for it's 4 Star comforts and quiet but great location just steps from downtown Inverness. Stein Inn - on the dramatic Waternish Penninsula, this secluded Old Country Inn with it's cozy fireside pub and peaceful waterfront setting is the perfect Scottish small romantic inn. Many romantic travelers roaming around Northern Europe and the Netherlands soon find themselves in Amsterdam. It’s an attractive city full of canals, cafes, bikes, interesting people...and interesting things! Amsterdam Canal Boat Tours - one of our most affordable and fun Amsterdam getaway ideas is the Canal Bus. It's a great hop-on, hop-off 24 hour ticket for exploring Amsterdam by water. Or you can get even more romantic with the Lovers Red Light Candlelight Cruise, a 2 hour evening cruise with wine & cheese, plus a guided walk through the Amsterdam’s Red Light district. Windmills of Schermerhorn - close to Amsterdam (about 40 km north), Schermerhorn is a great spot to see these landmarks of Dutch culture up close. There's not a lot of windmills left in Holland, so make sure you visit these remaining ones and the nearby museum. We review Santorini, Mykonos and Paros tips for a romantic Greek Island holiday. 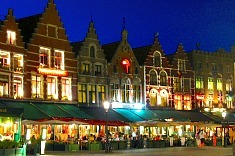 Honeymoon in Belgium - quiet Belgium is an ideal spot for a honeymoon getaway. 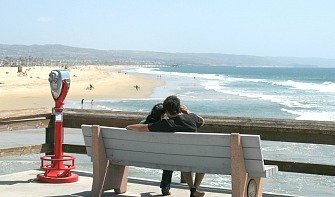 We describe some memorable spots and romantic places to stay. Bellagio, Italy - had enough of chaotic Rome? Try this relaxing & romantic resort village by the lake in Northern Italy. 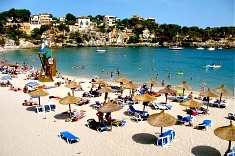 Honeymoon in Mallorca Spain - see what we found in our romantic Mallorca Spain vacation, including great beaches and honeymoon hotels. Europe Vacation Travel Information - official site of the European Travel Commission. This gorgeous small boutique inn will add romance to any honeymoon in Turkey. 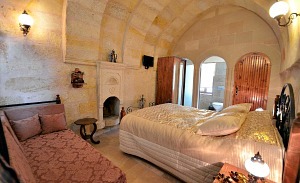 Located in charming Ortahisar, the Inn is perfectly situated for easy access to Capadocia's best attractions. 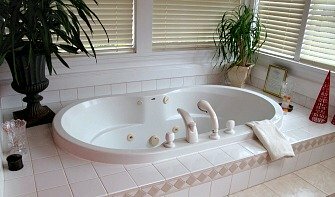 Each of the 5 rooms is uniquely designed with features including fireplace and Jacuzzi tubs. Satellite TV and free WiFi are also offered, and each morning you'll enjoy a wonderfully delicious buffet breakfast.